Designing a child's bathroom is a tricky proposition where you have to walk a fine line between creating a layout that's conducive to your childrens' needs now but will also be able to change and accommodate them in the future. There are a number of bathroom accessories that you can incorporate into this space that will hold a timeless quality your kids will love. 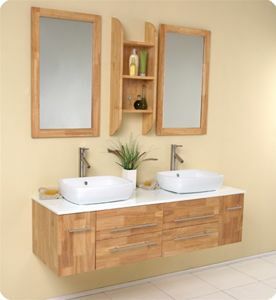 One of the best options to incorporate into your childrens' bathroom is a dual-sink bathroom vanity. This will allow your kids to have their own place to keep their toiletries and help you avoid fights over the bathroom when they're trying to get out the door in the morning. Another tip is to give your kids their own unique storage space. You can easily incorporate a medicine cabinet on either side of your mirror or bathroom vanity. Or you can opt for smaller linen cabinets that can be placed on the floor to help to de-clutter the room. A childrens' bathroom comes with its own unique set of design challenges, but there are more than enough ways to give your kids their own personal space and create a lasting aesthetic as they grow up.